'Elijah in the Wilderness', 1878, is representative of Leighton's most austere Classical manner. The hard-edged figures with well-developed muscles show the influence of Michelangelo. 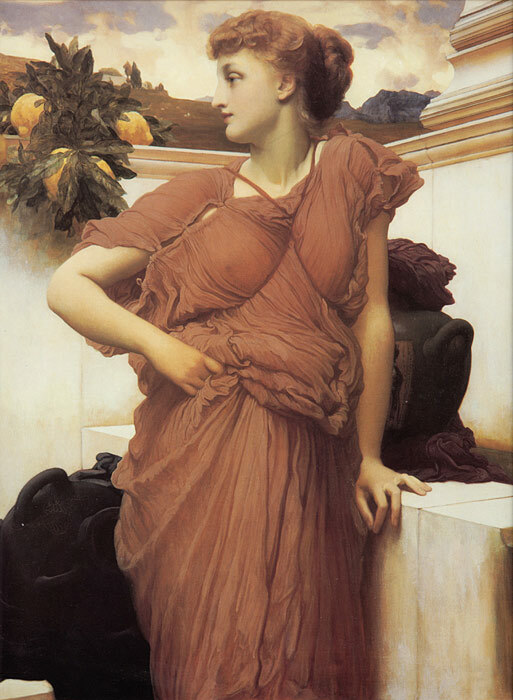 At the Fountain, c.1892, by contrast is a fancy painting by Leighton with softer drapery and a dreamy mood - closer in spirit to the 'Aesthetic' concerns of Albert Moore and others. SPECIAL NOTE : The painter will make the reproduction as close to the original oil painting as possible. If you want your painting to alter from this likeness, please email us and " At the Fountain, c.1892 " will be reproduced according to your special requirements.